Last year, David Bote and Adbert Alzolay were named to the Cubs’ 40 man roster. They were pretty much slamdunk choices. This year, there is no prospect who is an automatic choice. There are, however, several guys who are clear-cut favorites to be placed on the 40-man roster to either avoid losing them to free agency or the Rule 5 Draft. Currently there are 42 players on the 40-man roster with 2 of them on on the 60 day disabled list. Once they come off that list, they can either be released or they have to be placed on the 40 man roster. Which means, someone has to go. Drew Smyly is one of the two players on the 60 Day DL and he will start throwing outings this month. Hopefully, he can be back in time for the playoffs in a relief role. Justin Hancock, the other player on the 60 Day DL, lools like he is not coming back this year at all. Who Is Leaving for Sure? The Cubs only have three players, Justin Wilson, Jesse Chavez, and Anthony Bass, whose contracts expire at the end of the 2018 season. Wilson will not return, but Chavez and Bass both could come back to Chicago. That means, at most, one spot would be available. There are another four pitchers who have option years for 2019. Pedro Strop, Cole Hamels, Jose Quintana, and Brandon Kintzler can all have their contracts picked up by the Cubs. Strop and Quintana are the most likely to return. 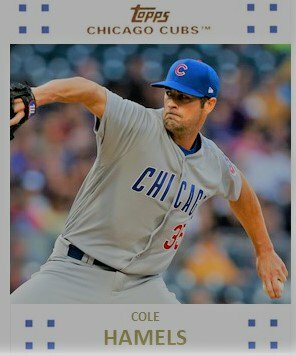 It’s just one start, but I really dig what Cole Hamels was able to do in his debut. Hamels could pitch his way onto the roster for 2019, but his $20 million salary stands in his way. I really doubt it if Kintzler will return. His option could only be $5 million. Let’s say that puts the total at 2 spots. There are another five spots that could be made by trying to get players through waivers and assign them to Iowa. Luke Farrell, Cory Mazzoni, Rob Zastryzny, Jen-Ho Tseng, and Alec Mills could all be waived to make more room. Of those five, Farrell and Mills arguably hold the most value. The other three are some tough choices. Let’s say, for the sake of argument, that they keep Mills and Ferrell and try to get Jen-Ho and Rob Z through waivers while releasing Mazzoni. That creates three more spots which puts us at five spots. The Cubs are not going to try and fill all five spots with their own prospects. At best, they would probably only pick three and take a risk in losing several others. That’s a lot of names, many of which are familiar to minor-league fans the past five years. The Cubs cannot keep all of them. Trevor Clifton – In a system that still has not produced a viable starting pitcher, Clifton looks to be close to being ready this year. He shown a mental maturity and has erased the second half of the 2017 season from his mind. The only thing he needs to work on is being more efficient in getting into the 6th and 7th innovation innings on a regular basis. For me, he is as close to a sure thing to make the list as the Cubs have this year. Justin Steele – he has yet to pitch above high A Myrtle Beach. Tommy John surgery in August 2017 set his development back a year. But now, he is back on track and throwing 95 miles an hour out of the pen with a tight breaking ball and a great mental makeup. The Cubs don’t want to take a chance on losing that kind of left-handed talent. Jason Vosler – As the most proficient power bat in the upper half of the system, Vosler, more than likely, could be placed on the 40-man based on need. If he is not, someone is going to snag up a power hitting lefty who can drive and runs. The issue is that he has no place to go with Bote, Bryant, and Rizzo ahead of him. Will the Cubs keep him as insurance or take the risk to see if someone else snags him. He is only signed for one more year. He looks to be a good bet to make the 40-man. Ryan is a MiLB free agent after the season ends and putting him on the 40 man might be the only way the Cubs can keep him. He has had a mixed year but has a 2.54 ERA in mixed roles in the second half for Iowa. As for Pereda, Rice, and Higgins, catchers tend to get picked up to be backups at the MLB level. They don’t get exposed every day and you can work them in slowly at the MLB level, if selected. Pereda, the youngest of three catchers listed, is the most likely to get a call, but he has yet to play above high A. The Cubs are likely to lose one or two of them. When the Arizona Fall League ends, will we get the answer. It is an interesting subject to think about the next three months.